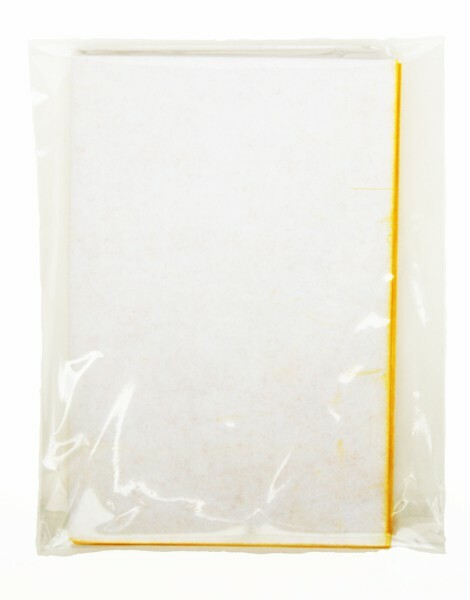 This large sheet of yellow waxy carbon transfer paper is used to trace patterns and to transfer markings onto fabric. 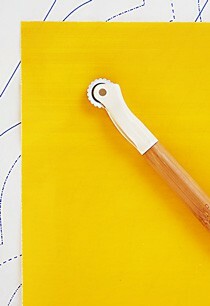 Yellow tracing paper is used most frequently for making marks on final garments. Blue transfer paper is used for muslins. Waxy carbon tracing paper is used for two purposes: tracing patterns and transferring markings onto fabric. It can be used on both paper and on fabric. To trace a pattern, place the carbon paper face down on top of a piece of paper. 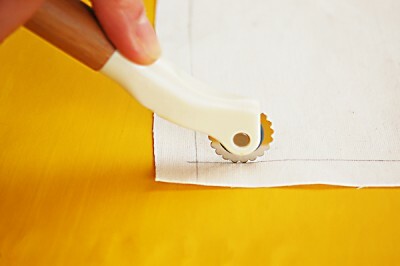 Tape the pattern piece you want to trace to the wrong side of the carbon paper, and use a blunt-edged tracing wheel to transfer the lines from the pattern piece to the paper. Either color can be used for tracing patterns. You can even use two colors: one to trace the pattern piece and the second to indicate any modifications you make to it. The lines that carbon paper and a tracing wheel allow you to make are very accurate and clear, so they are useful for transferring darts and other markings from a pattern to fabric. To transfer markings onto fabric while sewing, use the same approach as above transferring the marks onto the wrong side of your fabric. Keep two things in mind if you use waxy carbon tracing paper on fashion fabric. First, the markings are often permanent (they can sometimes be removed by a dry cleaner, but don’t count on it! ), so use the lightest color that will show and mark only the wrong side of your fabric. We recommend using the blue carbon for making fit muslins (because it is so dark and visible) and the yellow carbon on all fabrics other than fit muslins. The yellow is less likely to show from the right side of the finished garment. The second thing to keep in mind is the thickness of the fabric itself. Because the markings are permanent, there is always a possibility that they will be visible from the right side of the fabric if it is thin or sheer. Before making your markings on a thin or sheer fabric, test the carbon on a scrap to make sure it is not visible on the other side. To minimize postage costs, and to make it cleaner and easier to store, our tracing paper comes folded and packaged in a re-sealable plastic bag. I liked the large size and the ease of marking with this paper. However, large flakes of color were loose at the fold creases which were a mess...especially with the blue. Have not yet washed to see how marks come out. Been using carbon for decades — always been frustrated with all brands I used. But this is the FIRST and now ONLY paper that not just works but puts down a significant amount of pigment! Love this stuff! I don’t have to hunt for dots anymore — they stand out beautifully. Will never-ever try anything else. So many patterns come nested. 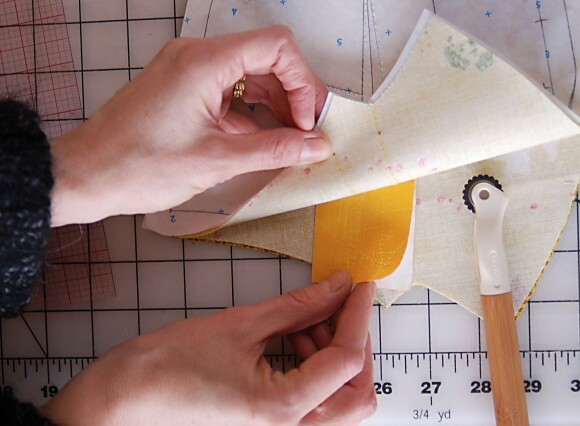 If you want to make multiple sizes of the same pattern, you either need to purchase a separate pattern for each size or trace the sizes onto muslin or paper. This carbon sheet is the perfect thing to use. It can be used many times. I wish I had thought of using it before. Have it in both blue and yellow - perfect for tracing patterns to tracing paper, or for tracing directly onto fabric (depending on the application). great stuff. very hard to find. lasts forever and marks clearly. Your service and delivery were excellent. It's great to have such a large piece of carbon paper and ideal for laying pattern pieces onto, but I do find it very messy. The slightest touch deposits a lot of ink,. However, I may find it easier to use with practice. I am a fashion designer & I use this paper for transferring my patterns. It is awesome! Waxy carbon paper is great for two purposes: tracing patterns and transferring markings onto fabric. It can be used on paper and on fabric. I like the blue and yellow carbon paper for almost everything, and these two colors serve different purposes. I’ll explain how and when I use them. I use this carbon paper for making muslins so I can see the seam lines, dart markings, and notches as I’m making adjustments to a fit muslin. I talked about this in the muslin tutorial, if you’re interested in learning more. I mostly use blue carbon for muslins because the carbon lines are extremely visible on the fabric, but if I’m making a correction and want to distinguish my new markings from the original (blue) markings, I’ll switch to the yellow so I don’t confuse them. Waxy carbon can also be useful for transferring markings to your fabric when you’re sewing. The lines it makes are very accurate and quick to transfer with the carbon and tracing wheel, so they’re great for transferring darts and other markings. There are two things to keep in mind if you use waxy carbon on fashion fabric. First, waxy carbon markings are often permanent (they can sometimes be removed by a dry cleaner, but don’t count on it! ), so use the lightest color that will show on the wrong side of your fabric and mark only the wrong side of your fabric. You don’t want those markings to show when you’re finished! I almost always use the yellow carbon on fabrics other than a fit muslin because the yellow is less messy and less likely to show from the right side of the finished garment. The other thing to keep in mind is the thickness of the fabric itself. Again, because the markings are permanent there is always a possibility that they will be visible from the right side of the fabric if your fabric is thin or sheer. So test the carbon on a scrap of fabric if you’re not sure whether it’s safe for the fabric you’ve chosen. For many fabrics it will be fine, but it’s always a good idea to check first, just to be sure. Cut a small piece of carbon paper from your big sheet. A piece of carbon about approximately 8″ x 4″ will work well. Fold it in half lengthwise, carbon side out. Then when you need to transfer pattern markings to the wrong side of your fabric (like at a dart), slip the folded carbon paper between the two layers of fabric and trace the lines and markings with your tracing wheel. The carbon will transfer those lines to your fabric! This is a great way to get a very accurate transfer with minimal effort. It’s a good idea to use the lightest carbon color that’s still visible, so it might be a little hard for you to see my yellow markings in this photo, but they’re clear enough for me to see when I sew the dart. You can re-use your little folded piece of carbon paper over and over again, so keep it in your sewing supplies along with your tracing wheel.